Megan Kerstetter is a cartoonist and illustrator with a passion for all thing’s imaginative and extraordinary. She has a wide range of interest when it comes to art, from illustration and comics, to 3D modeling and animation. 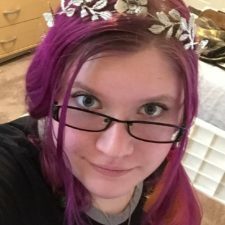 A fan of the creepy-pasta genre for roughly the past three years, she is now trying her hand at narrating some spine chilling tales herself. “I’ve always had a soft spot for horror, even though I am often the most scared when it comes to viewing it’s content. Since I was young, I’ve had a fascination with the urban legends and the supernatural. I grew up reading the Michigan & American Chiller series by Johnathan Rand as well as stories by Bruce Coville. As I got older my father introduced me to Steven Spielberg, Tim Burton, and Steven King movies; there was a dabble of Alfred Hitchcock’s ‘The Twilight Zone’ in there as well. Eventually I found shows like Supernatural, and of course in college the big thing was to watch horror films with my roommates. It was during the middle of college I found the horror narrations genre on YouTube; Chilling Tales being one of the first I played consistently, along with CreepsMcPasta and many other channels in a similar vein. The stories were great to listen to while working on assignments - they’re still great to listen to now – and I’m really happy to be adding my voice to the narration community!” If you are interested in Megan’s art as well as her start in narration and voice over, you can go to her main channel under the name, “Megan Kerstetter” as well as a new channel she’ll soon be launching called Prompts & Pasta’s where she will perform narrations under the pseudonym of Crescent Hollow.